Ron Zacka, CEO of Parklands , a leading supplier of quad bikes and UTVs to the farming sector is increasingly concerned about the safety challenges faced by quad drivers. Accidents involving quad bikes have resulted in needless deaths and injuries, also raising questions about their safety especially on farms. With 78% of these accidents taking place on farms and 18% involving children under 16 years of age, one needs to examine risk reduction strategies for quad bikes. 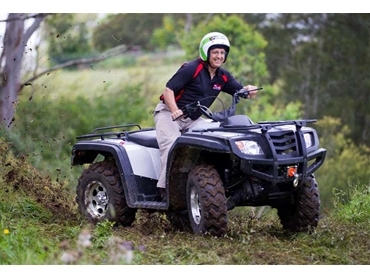 Most quad bike manufacturers adhere to stringent quality and safety standards. The Hi-sun brand, distributed by Parklands in Australia conducts road testing on each and every bike before it is packed for shipment. Parklands also conducts additional testing in Australia. Parklands CEO Ron Zacka comments that the roll bar or Crush Protection Device (CPD) is effective only if there are seatbelts fitted in the vehicle, and actually used by the drivers. Ron Zacka, who sells the majority of his quad bikes to the farming sector through a nationwide dealer network, has frequently witnessed unsafe use of these machines including use at excessive speeds, without helmets, and by young children who should not be allowed to operate such machines. Despite warning stickers, recommendations and stringent testing as to the maximum capacity of quad bikes, unnecessary risks are created by users attempting steep slopes, overloading the quad bikes and driving them at high speeds, often without protective gear. Another issue on the farm, according to Zacka is the dangerous overloading of bikes with fodder, equipment and materials making them prone to tip or roll, which is the biggest danger of these otherwise reasonably safe vehicles. He observes that many farmers have switched to Utility Terrain Vehicles (UTVs), which are set out more like a car, have a broader frame, better height/width ratio and are hence much more stable without compromising on capability. UTVs offer side-by-side seating, allow for a wide range of utility attachments and have ample storage for fodder, materials, tools and equipment. Features such as protective frames, seat belts, windshield and roof as well as doors raise the safety factor in these vehicles. Parklands recently took their range of quads and UTVs through another test, getting bike and 4WD experts to push the quads to their limit at the 4WD track at Eastern Creek Speedway and on a farm near Sydney. Zacka explained that a key objective was to really test the bikes’ capacity and despite considerable experience among the drivers and no excessive loads, a few managed to tip over, which clearly reinforced the fact that it was important to stay within specified speed and weight recommendations for any vehicle. While manufacturers need to go to greater lengths to improve suspension and conduct stringent capability testing, operators of quad-bikes are advised to ride them with more caution and common sense. It is also important that quads are not operated by drivers under the age of 16. Parklands Power Products is an established supplier of outdoor power tools, quads and UTVs, servicing the whole of Australia through their 800-strong dealership network.